We started seeing some of the “assumption players” drop off the board in Round 3, as I picked up Steven Jackson as a Falcon, and Chad Scott selected Steelers’ rookie back Eddie Lacy. I really believe Jackson can be a low-end RB1 in Atlanta next year, as he’d get more red zone opportunities in a potent Atlanta offense than he’s had throughout his Rams’ career. Just last season, Turner had 51 red zone carries, and 26 of them came within the opponents’ 10-yard line. Jackson, on the other hand, had just 27 red zone carries and 15 carries within the opponents’ 10. That, to me, screams opportunity, even with an aging back. Chad’s Eddie Lacy selection could be a potential steal if the Steelers were to utilize him in a primary role. It would seem that would be the case since they’d be using a first round selection on him, but given the way Todd Haley handled the running back situation in Pittsburgh, there’d still be some question mark. And because Chad went with two receivers in the first two rounds, he now has to rely on this rookie back to carry the load as his RB1. It’s risky, but it could pay off. Aside from these two, the highest risk/reward choice in Round 3 has to be Denny’s Lamar Miller selection. Though he should be the top guy in Miami’s offense next season, his lack of NFL touches is risky no matter his ability. The same could be said for David Wilson, who was selected just a few picks prior. 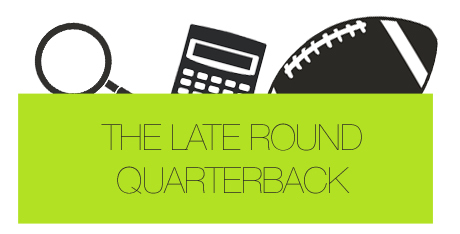 We started seeing more questionable choices in Round 4 of the draft, as quarterbacks finally started flying off the board. Even I think there’s some value in top-tier quarterbacks at this point in the draft, but I still have to wonder why Kaepernick was selected as early as he was. I understand his overall allure, but think he could’ve been selected at least a round later. Another unexpected choice was Austan Kas’ BenJarvus Green-Ellis selection. Though he will surely get touches, you’d have to be a little concerned with Giovani Bernard in Cincinnati. I’d think The Law Firm will be somewhat fantasy irrelevant the instant he gets moderate competition in the Bengals’ backfield. I wouldn’t expect another high-touch season if the Bengals do indeed get a top running back in the draft. Roddy White was a great value pick for Denny Carter at the beginning of Round 4. White, because of the emergence of Julio Jones, has been slipping further and further in drafts. There’s little reason for this, considering the guy has had 80 or more catches, six or more scores and 1,150 or more yards in every season since 2007. He’s arguably the most reliable receiver in fantasy football, and should be able to post comparable numbers in 2013. Ladd Davies took the Welker risk in Round 5, which could end up being a steal. Depending on how head coach Marc Trestman uses Welker in the Bears’ offense, he could be a nice underneath option for Jay Cutler. And when you consider the pressure Cutler faces on nearly every snap, Welker could become a nice short yardage receiver for the polarizing quarterback. After Austan made a questionable call in Round 4 with BenJarvus Green-Ellis, he really found value in Reggie Wayne with the first pick in the fifth round. Though I’m skeptical about the Colts’ passing attack in 2013 because of new offensive coordinator Pep Hamilton, Wayne should still see a high volume of targets. I’m also expecting him to increase his touchdown reception number from the five he had in 2012. The biggest question mark I saw in this portion of the draft was Chad Scott’s late-round Jeremy Maclin selection. Now, if you’re a believer in what Chip Kelly can do in Philadelphia, then I understand the urge of drafting as many Eagles as you can. But Maclin has yet to prove himself as a reliable fantasy option. During his four seasons in Philly, Maclin has yet to have a 1,000-yard season, and he’s played all 16 games just once. To me, Jackson is the receiver to own in Philadelphia this year. Denny Carter of thefakefootball.com agrees. I guess this is the perfect time to promote my latest article on ProFootballFocus.com about Steve Smith (click here to view it). Plain and simple: I love his value. He’s been nothing but consistent with Cam under center, and the fact that his ADP has hovered so low is mind-boggling. Even in best ball leagues, Smith shouldn’t escape Round 6. There were definitely some odd choices in Round 6. Though Steven Jackson is a Falcon, I’m not sure Isaiah Pead is the top option in the St. Louis backfield. I love his talent, but the Rams sure liked Daryl Richardson last season. Pead’s a big risk in Round 6, and while it could easily pay off, I think he could’ve been selected many rounds later. Another reach, to me, was Ryan McDowell’s Mark Ingram pick. Again, like Pead, this could easily work out. But I think from an ADP standpoint, Ryan could’ve waited a little longer to get the questionable Saints’ running back. The last overvalued pick has to be Ryan Williams (sorry, Chad). With Rashard Mendenhall in Arizona, I’d expect the injury-prone back to take the back seat while Mendenhall steals the show. And even if he was still the starter, fantasy owners should be wary about a back who’s played just five games in his first two seasons in the NFL. I’m low on Williams, especially with so much talent still on the board. Though I’m being a downer, there were some solid Round 6 picks. Denny and Jake both got top quarterbacks, and if RGIII comes back healthy, Ladd did as well. I’m fine with the quarterback choices; I think value would tell you that these guys are worthwhile at this point in the draft.